OSA occurs when relaxed muscles block the airway, resulting in pauses in breathing. Photo courtesy of Wikimedia Commons. During sleep, the body’s muscles relax causing the soft tissues of the airway to collapse and obstruct the airway. The pauses last for several seconds and can occur up to 30 times an hour while asleep. The body reacts to this obstruction by disrupting the sleep pattern enough to start breathing again. Although you may not notice the interruptions in your breathing, they result in a transition from restful, deep sleep to a light sleep that isn’t sufficient to function normally, leaving you very sleepy during the day. Other symptoms include snoring loudly, a morning headache and dry mouth. Dr. Alexanians has the training and experience to successfully treat patients who are suffering from sleep apnea or snoring disorders using custom oral appliances. 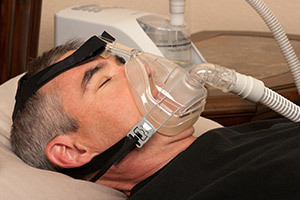 A CPAP machine has been commonly used to treat OSA in the past; however, many patients simply can’t tolerate the device. The traditional treatment of sleep apnea has been through the use of a CPAP (Continuous Positive Airway Pressure) machine while sleeping. The CPAP machine uses a mask worn over the nose to provide a constant flow of air into nose and/or mouth. While treatment with a CPAP device is effective, at least half of the patients using the machine find that they simply can’t tolerate it. An alternative to the CPAP machine is the use of an oral appliance, as recommended by The American Academy of Sleep Medicine. Oral appliances have been proven to be effective in treating mild to moderate sleep apnea, and many patients find this option to be much more comfortable. Oral appliances, such as the EMA (top) and Dorsal (bottom) are a minimally invasive and highly effective means of treating OSA. Dr. Alexanians uses noninvasive oral appliance therapy to help patients suffering from obstructive sleep apnea disorder, and he has found both the Elastic Mandibular Advancement Appliance (EMA) and the Dorsal Appliance to be quite effective. These custom oral appliances are designed to move your lower jaw forward, and open your bite to allow for less restricted airflow during sleep. Unlike CPAP machines, oral appliances fit entirely inside your mouth, they are portable, they do not use electricity or make noise that would bother a sleeping partner, and they allow you to change positions while sleeping. With the EMA and Dorsal Appliance, you can even comfortably open your mouth to speak and drink water! Many factors may contribute to snoring, such as allergies, alcohol consumption, a cold or being overweight. 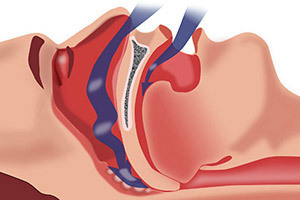 Snoring occurs when the muscles in the roof of your mouth, throat and tongue relax to a point that allows for partial obstruction of your airway. Most of the time snoring does not aversely affect your overall health. However, about five to ten percent of people who snore (usually quite loudly) have sleep apnea. Snoring can be easily treated with an oral appliance that keeps airways unobstructed during sleep. Come in for a visit and see if this therapy is right for you.